The Tataviam Indians, a fairly small group that occupied the Santa Clarita Valley by AD 500, were members of the Uto-Aztecan language family and spoke a Takik dialect. 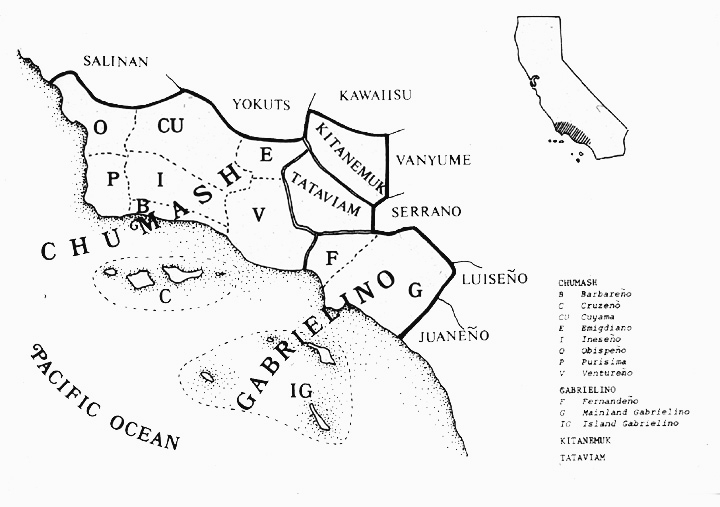 Their neighbors in the Antelope Valley, the Kitanemuks, and their neighbors in the San Fernando Valley, the Gabrielinos (or Tongva), also were members of the Uto-Aztecan language family. Their neighbors to the west, however  the Chumash  spoke a completely unrelated language and probably inhabited Ventura County well before the arrival of the nearby Uto-Aztecan speakers.